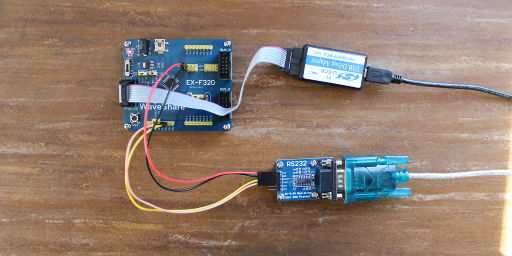 This short tutorial presents a simple "Hello World" program for the WaveShare EX-F320, either the premium version (which includes the DVK501) or the standard version with an extra RS232 board. The author used a Debian GNU/Linux system, but the tutorial should work for other Linux distributions, *BSD or other Unices. The Small Device C Compiler (SDCC), version 3.4.0 or later to compile C programs for the MCS-51. The C8051F340/380 board is connected to the host computer via a U-EC6 for power and to write the demo onto the board. 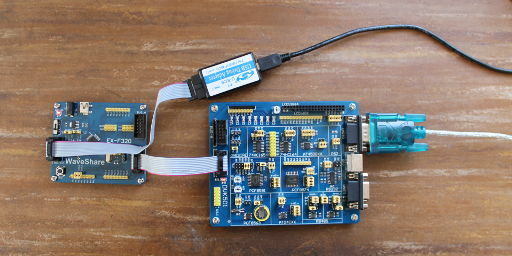 Depending on wether we use the premium version or the standard version with RS232 board, the communication setup is different: For the EX-F320 Premium we connect the DVK501 board via the BUS-B connector, which will do for both data and power; the serial cable is then connected to the UART0 header of the DVK501. For the EX-F320 Standard with RS232 board, we connect the RS232 board to the PD5 and PD6 headers for data (TxIN to P0.4, RxOUT to P0.5) and to the power header for power (VCC to +5V, GND to GND); the serial cable is then attached to the RS232 board. // Configure UART for 4800 baud, 8 data bits, 1 stop bit. SCON0 |= 0x02;				// Tell putchar() the UART is ready to send. SDCC is a freestanding, not a hosted implemenatation of C, and allows main to return void. In SDCC up to SDCC 3.6.0 putchar() used to return void. This is not standard compliant and was changed to int in current SDCC versions. The printf() from the standard library uses putchar() for output. Since putchar() is device-specific we need to supply it. In this case we want it to output data using UART0. The demo can be compiled simply by invocing sdcc using sdcc -mmcs51 --std-c99 serial.c assuming the C code is in led.c. The option -mmcs51 selects the target port (mcs51). An .ihx file with a name corresponding to the source file will be generated. Assuming the board is connected to a U_EC6 attached via USB, ec2writeflash --port USB --hex serial.ihx --run will write the demo onto the board. You can see the "Hello world" by attaching a serial cable to the DB9 connector on the RS232 board, and using a terminal program configured for 4800 baud, no parity, 8 bits, 1 stop bit and no flow control.